We know MPVs or ‘people-carriers’ have lost out in terms of sales throughout Europe to the status-enhancing and fashionable SUV/Crossover type models. The tide could turn because customers who prefer practicality as opposed to following fashion now have available plenty of alternative new and revised MPV models to choose from. One such range is the second generation Touran seven-seater MPV, priced from £22,270 to £31,535. This second generation Touran has arrived 13 years after the original, which gained close to 2.0 million global sales, of which around 100,000 sales went to UK customers. The UK’s MPV market in 2015 was worth 131,085 sales, a fall of 21% over those achieved in 2014. By comparison, SUV sales in the UK increased by 21.5% to 355,118 units to become the third largest sales sector after Superminis and Lower Medium family cars. Traditional best sellers in the UK’s MPV market sector are the Citroën C4 Picasso and Grand Picasso, Ford C-Max, S-Max and B-Max, Vauxhall Zafira Tourer and the VW Touran – but there are others big and small. 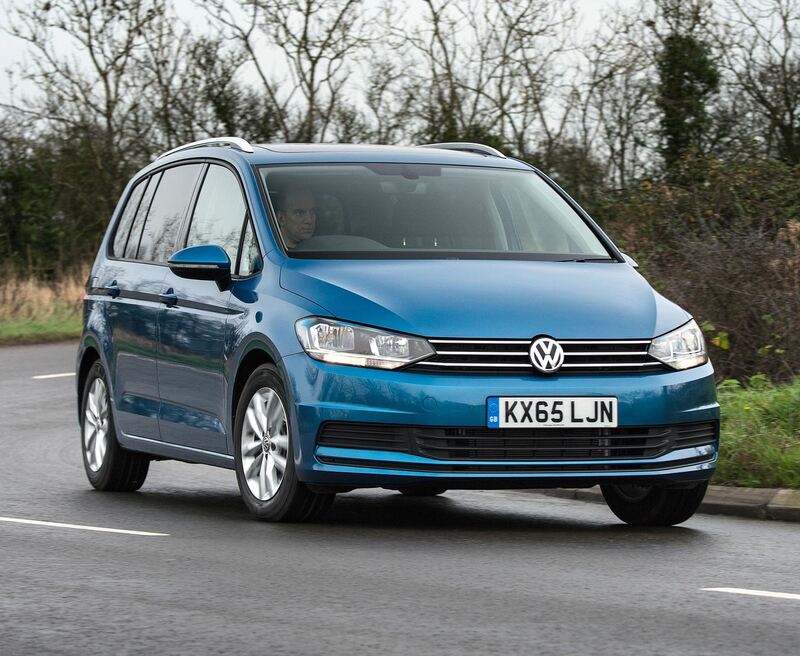 The latest Touran is based upon VW’s highly rated Golf. It uses a version of the same MQB platform and mechanical components but it is larger inside and out. The length has increased by 130 mm (5.1 in) to 4,527 mm (14.85 ft), it is wider, it’s marginally lower for better aerodynamics and the wheelbase is 113 mm (4.4 in) longer at 2,791 mm (9.2 ft) so that has resulted in more legroom for the three rows of seven independent seats. For good child safety all five seats in the middle and third rows have Isofix child seat preparation. There is a full range of seven airbags and for good measure an automatic post-collision braking system is standard-fit on all versions. To maximise the multiple seating and load carrying combinations, each of the three individual middle row seats and two separate rear row seats all fold flat to create a maximum cargo space of 1,857 litres (65.58 cu.ft). With the rear row of seats in use the boot capacity is 137 litres (4.84 cu.ft) but with the third row folded down, the most common use, the figure is 917 litres (32.38 cu.ft) and there are 47 different storage compartments to lose stuff in. For maximum seating flexibility each one of the middle row of three separate seats individually slides fore and aft. 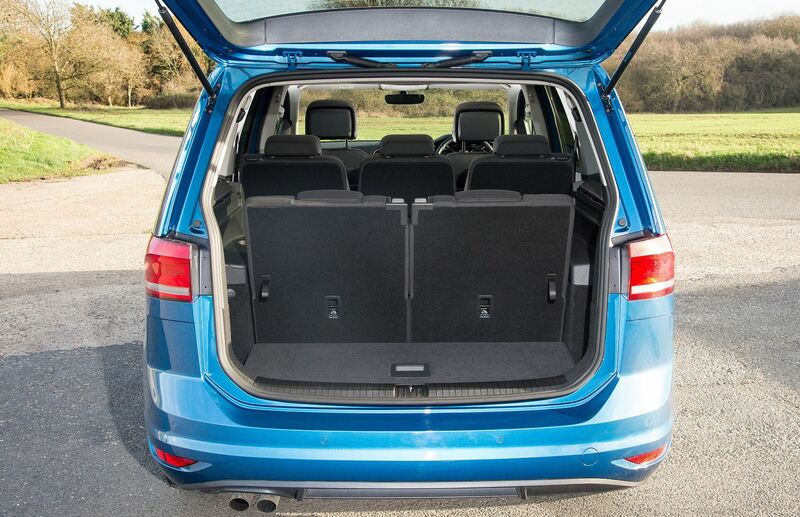 The rear passenger doors open wide so access to the middle and rear rows is easy. With good headroom throughout, the new and roomier Touran measures up as a mid-sized MPV for family or business use and for active lifestyles where size matters. There is the choice of five trim and equipment levels; S, SE, the new SE Family level, SEL and R-Line. 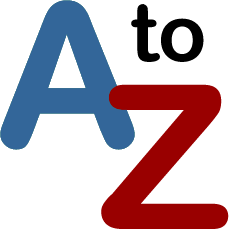 When it comes to engine choices there are five – two petrol and three diesel units. There is a 1.2 TSI 110 hp petrol with a six-speed manual gearbox, a 1.4 150 hp petrol with manual or auto transmission options, a 1.6 TDI 110 hp turbodiesel manual or auto, a 2.0 TDI 150 hp turbodiesel man or auto or a 2.0 TDI 190 hp turbodiesel with a six-speed twin clutch DSG auto box as standard. The engine choice available depends of the spec level chosen. The new or uprated engines are claimed by VW to be 19% more efficient than the engines they replace. 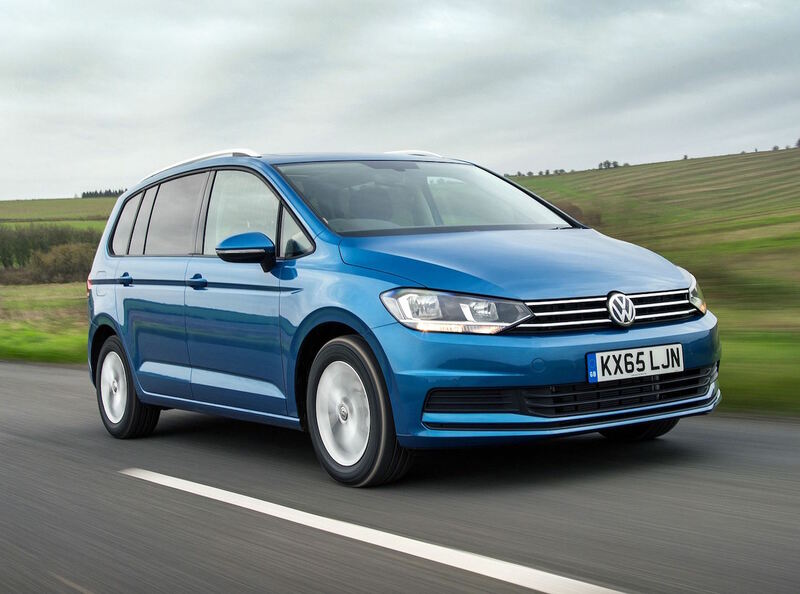 Volkswagen says that out of the 4,000 Tourans they sold in the UK last year 90% were diesel models, with the 1.6 litre being the most popular due to its lower purchase price and running costs. Even the base S version has VW’s Composition media system, air-con, DAB radio, Bluetooth and roof rails. The SE additions include 16-inch alloy wheels, front and rear parking sensors and Multi Device connectivity. The new SE Family specification I tried has a large panoramic sunroof, adaptive cruise control, Discover sat-nav, Car-Net guide, a cargo space management system, voice amplification through the in-car phone microphone and speakers and PreCrash preventative occupant protection. The SEL level adds 17-inch alloys, Car-Net App-Connect and three zone air-con. The recently added R-Line is a racier version in terms of equipment with sports seats, stainless steel pedals and an exterior body styling pack. 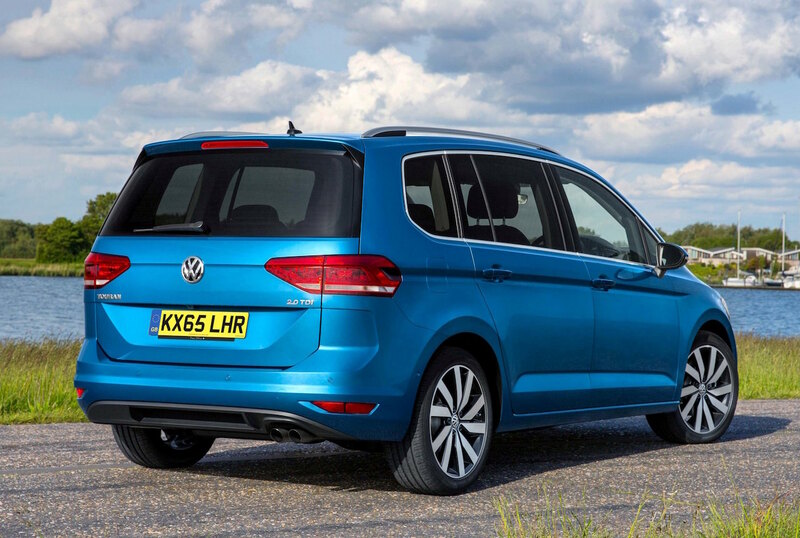 Styling wise, outside the Touran has the appearance of a steroid enhanced Golf at the front end with large windows at the sides and a tall tailgate at the rear. It doesn’t have the appealing styling of the Citroën C4 Picasso or the larger Ford S-Max, it’s more function over fashion. Inside it looks modern; bright with clean lines, plus sensibly-placed, simple to use controls with lots of easy to clean vinyl covered surfaces. Everything looks and feels very practical and durable, which are common themes throughout the vehicle. Ride comfort was good and that is an important function when carrying a family on a long journey, just as it is with the business driver spending long driving hours in the vehicle. My test version with the new SE Family specification was powered by the 2.0 litre TDI 150 hp turbodiesel unit with a six-speed DSG twin clutch auto gearbox. This engine is well known throughout the VW Family group of brands. It produces 340 Nm (251 lb.ft) of torque from 1,750 rpm and worked really well with the fast/smooth-changing six speed twin clutch auto box, which has a Sports mode. The engine is reasonably refined and pulls strongly throughout its rev range. It also proved to be effectively fuel efficient during my time driving it on the usual mix of motorways, A/B main roads, winding country lanes, and with some in-town travel. Officially the Combined Cycle fuel consumption is 60.1 mpg and overall my vehicle returned 48.2 mpg which for a vehicle of this size I think is good. During one 50-60 mph country road journey the figure was as high as 63 mpg without trying. With CO2 emissions of 125 g/km the VED road tax cost £0 for the First Year rate and then £110 for Year Two onwards. Company car drivers will pay 25% Benefit-in-Kind tax. With this engine the Touran is no slowcoach either, with a top speed of 128 mph, and zero to 62 mph takes 9.3 seconds. 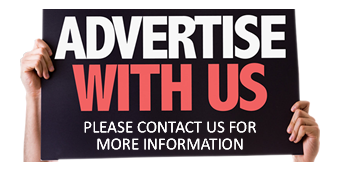 With low running costs and impressive performance the only issue was the price. My test car weighed in at £29,545 but if the manual gearbox is chosen it drops to £28,245. Value for money and eye-catching must-have kerb appeal are not the Touran’s strongest points but its ability to meet the real-life demands of a family or business user is high. Deciding positive factors will be its well-mannered driveability, relatively low running costs, seating/load carrying versatility and durability. For: Versatile seating, durable, comfortable ride, high level of standard safety equipment, easy to drive, handles well, strong fuel efficient engine, slick auto gearbox, low running costs. Against: Conservative exterior styling, durable rather than a plush interior, costing nearly £30k it looks expensive to buy. Volkswagen Touran SE Family 2.0 TDI 150 hp, 6-speed DSG auto. Engine: 2.0 litre, 4-cylinder, turbodiesel. Torque: 340 Nm (251 lb.ft) from 1,750 rpm. Transmission: 6-speed twin clutch DSG automatic, front wheel drive. Fuel consumption: 60.1 mpg Combined Cycle (48.2 mpg on test). Emissions and taxation: CO2 125 g/km, VED £0/£110, BIK company car tax 25%. 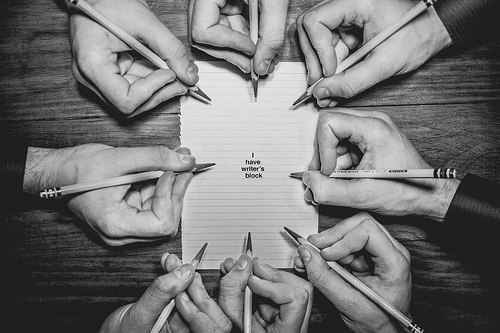 Insurance Group: 17E. Dimensions/capacities: L 4,527 mm (14.85 ft), W 2,087 mm (6.85 ft), H 1,659 mm (5.44 ft), boot/load space 137 to 1,857 litres (4.84 to 65.58 cu.ft), braked towing weight 2,000 kg (4409 lb), 5 doors/7 seats.